Cinnamon rolls from the grocery store bakery with Kona coffee makes a wonderful breakfast on a lanai with a view. 1. Limit/avoid the hotel breakfast buffets. I’d estimate that the average resort breakfast buffet costs $25 per person. For a couple on a week’s vacation, you could easily rack up a $350 bill (plus gratuity) on breakfast alone. If you extend that cost to a family of four and eek! It’s a treat to enjoy the resort’s breakfast buffet on a limited basis to keep save some cash and calories, too! Ask if the hotel restaurant serves an à la carte breakfast menu. You’ll probably save $10 or more per person just by ordering off the menu. For example, instead of paying $25 for the macadamia nut pancakes and bacon that you want off the buffet, order that breakfast option from the menu for less than $15. In many cases, you’d also save money over the buffet option just by getting room service and enjoying breakfast from your lanai. It sounds decadent, but it’s true. Many Hawaii resorts have a coffee shop with fruit and pastries. Scope out your resort to see if they have a coffee shop or if there’s a shop nearby. 2. Eating la vida local. There’s two really simple ways to try Hawaii’s flavors while truly enjoying a slice of local culture. Go to a farmers market where you’ll find all kinds of ono grindz (good local food). No matter where you travel, the locals know where to find the best food at reasonable prices. So, find the locals’ favorite restaurants and bakeries. See this list of local favorite restaurants across Hawaii. There’s plenty of great restaurants around Hawaii that tout sunset ocean views, but you can’t get any better sunset view than having a picnic on one of Hawaii’s golden sand beaches. You’ll pay around $30 or more per entree at the restaurants, but a picnic will cost much less. You can buy a lot of yummy picnic supplies for $30, can’t you? 4. The early tourist catches the restaurant deals. Roy’s restaurants all across Hawaii offer a great three-course prix fixe menu for $36. We found a great three-course sunset menu from Pineapple Grill on Maui for $32. Sansei is one of our favorite restaurants on the Big Island, Maui and Oahu. They usually offer some sort special pricing for early or late dining. On Kauai, the Hukilau Lanai offers a special multi-course dinner for $28 for food only or $40 with wine pairings. Many restaurants and bars across Hawaii offer great specials on drinks and appetizers with happy hour deals. (Happy hour is also known as pau hana in Hawaii.) Check HappyHourHawaii.com for a good listing of deals. Planning your Hawaii vacation dinner around sunset is a rewarding experience. 5. Take advantage of the grocery stores, coupons and cheap eats. Pick up a copy of the local newspaper which advertise dining specials — some with coupons and some without. Check Oahu (Honolulu) Groupon Deals that offer both restaurant and tour deals. The Hawaii Entertainment Book offers quite a few dining coupons that are predominantly for Oahu. Their Oahu luau coupons are more than worth the price! Have a Costco membership? Bring your card for access to Costco on all the four major islands. See a few more ideas from this Maui coupons and discounts post. For Kauai, see this list of the best Kauai cheap eats. 6. Bring a few snack from home. It’s helpful to have a stash of your favorite snacks to keep you from paying resort sundries shop prices. I asked our savvy Go Visit Hawaii facebook community for their input on snacks and food that they bring to Hawaii to help save money. See all their suggestions here. 7. Stay where you have kitchen access. Yesterday, I shared advice on how to save money on Hawaii vacation accommodations, mentioning that staying in a condo or vacation villa is a great way to save money. I’ll add a studio with a kitchenette is a great choice, too. If you have the ability to make a few meals in your accommodation, you can really save compared to continually eating out. This idea makes breakfast time especially cheap and easy for families. Accommodations with a kitchen help you save. So, those are the seven major strategies we’ve used to save money on our Hawaii vacation dining. What other ideas would you suggest? Honolulu has groupon now. I’d suggest looking a few months ahead for some good restaurant deals. Maybe at restaurant.com too. Thank, JulieAnn! I’ve been watching Honolulu Groupons and I’ve come across some very good deals for tours and dining, too. Thanks for the comment, I’ve updated the post. Ambria — lately it seems that there’s more spa and activity deals than there are dining deals on groupon. It’s somewhat unpredictable. Ask a local. Waikiki and other resort areas have high rent so many times they scrap the “Dollar Menu” and sometimes they mark up the entire menu a dollar or two – but not everywhere. The local hotel workers and people like that need to eat but they aren’t rich. They know exactly where all the best cheap-eats are. For example: They likely know which SubWay restaurants have the “Five Dollar Foot-Longs” and which ones don’t, etc… Just tell them that you’re on a budget and ask them where they eat. Ask for suggestions and tell them what you like, etc. Order a Pizza! – Room service doesn’t get any cheaper or easier than that and the kids will love you for it! Some beaches are most easily accessible by a public walkway between two beach houses. So – ask them if they can deliver the pizza to you, right in front of one of the beach houses. Also – Waikiki has a decent Pizza Hut where they don’t jack up the prices. It’s a Pizza Hut/Taco Bell that’s located in the downstairs food court – Across from the Royal Hawaiian Shoping Center – Near the corner of Seaside & Kalakaua. It may or may not be too expensive for you to have a nice, romantic dinner at a fancy restaurant with a view but that doesn’t mean you have to sit in your hotel room all night and watch TV. Go out for drinks! The Honohono Room on the 30th floor of of the Waikiki Shariton has a fablous restaurant and an absolutely amazing view of Waikiki. It also has a really nice bar with a spectacular view. Show up right before sunset and have a couple of Mai-Tais as you watch the sunset. House Without a Key in the Halukalani Hotel is another one of those spots where you can enjoy luxurious surroundings, live Hawaiian music and a front row seat at the beach for the price of a couple of Mai-Tais. Hawaii has quite a few places like that. Just because you’re not staying at the 5-Star hotel doesn’t mean that you can’t get dressed up, order some drinks and enjoy the atmosphere & surroundings. Also… I’m pretty cheap but I don’t mind spending good money if it’s worth it. I visited both of those places for drinks at first to see how the service was, check out the menu and the view and to see if it’s worth the money to go there for dinner. I highly recommend both places. In my opinion, they aren’t over-priced because you do get what you paid for. Most of the people that I’ve taken to places like that for drinks also wind up going back for dinner but not always. Sometimes it’s just nice to go out for drinks. Dave – great suggestions! I love your idea about going to the fancy schmancy restaurants for drinks. You get to experience what ll the fuss is about, but without spending a load of money. Brilliant! I do love House Without a Key! Thank you for introducing us to that! Sadly the Hanohano Room at the Waikiki Sheraton closed last October/November. I think it’s going to be reintroduced at some point, as a breakfast lounge for Starwoods members and then a cocktail lounge/club in the evenings…. at least that’s what the Starwoods PR expert told me back in October. It doesn’t look like it’s reopened just yet. Also, many hotels will offer deals that include the buffet breakfast for free. At someplace like the Hyatt Maui, this is quite a deal! When we get the breakfast deal there, we fill up on breakfast, skip lunch, and then have the sunset dinner. 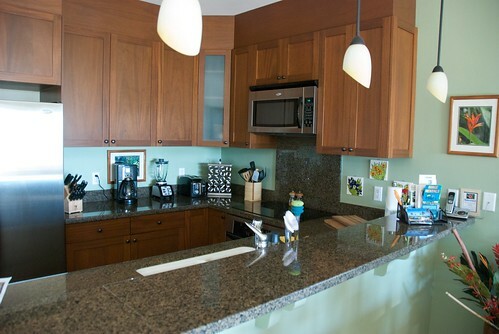 We stayed at the Maui Kai before, which was a 1BR w/ kitchenette. We bought food at the nearby store (I think it’s called the Times Store now). A little pricey there, but some things are decently priced. Safeway and Longs in Lahaina are both very reasonable (for Maui). We love Flatbread Pizza in Paia. One way we saved money on a recent visit was by stopping at Flatbread so I could have a pizza, and then continuing to Mama’s for my wife’s dinner, while I had dessert from Mama’s. If you want to check out an expensive restaurant, but don’t want to spend too much, go for drinks, as suggested, or for dessert or an appetizer. On our next visit, we are taking advantage of some free nights (I love points!) for the first 8 nights, so eating out is okay, and then we are staying at our timeshare the last 7 days, where there is a full kitchen and lots of outdoor grills. We are planning on our 1st vacation to Oahu this March and are including our last child at home our 15 yrs old son and it sounds as though you could maybe offer some much appreciated advice for the best deal(s)so we don’t have to break the bank to take this trip. I hope you don’t mind my asking you for advice? We are choosing Oahu, because one of the sights we would be humbly moved to visit is the USA Arizona so which airport would we be flying into (we are originally from San Antonio, TX)I realize I most likely asking way too many questions but, since it usually falls on me to make any bookings,also are there nice hotels (inexpensive) that allow dogs? Sounds like you could use our First Time Hawaii Visitor’s Guide: https://www.govisithawaii.com/first-time-visitors-guide-to-hawaii/ 🙂 It answers all your questions and more! Thank you for this. I love that I’m not the only one who doesn’t want to spend all their vacation money on food! How about planning for bottled water or are there places to refill reusable water bottles on Oahu, Maui and the Big Island? I am hoping for refills to save on bottled water. Tap water in Hawaii is safe to drink. Thanks for all these great tips. I am from New Zealand and will be travelling over near the end of October and looking forward to the trip. One thing that hasn’t been mentioned is tipping. Is this part of Hawaii? and how much do we tip if necessary. Thank you. Thanks for the tips, Hawaii really can be expensive but there are some creative ways to have a great trip on a budget.